I was taken through to the ward that I was on last Wednesday for the egg retrieval, and asked to put my PJs on. I took this to mean my eggs were not all dead and that the embryo transfer would go ahead. As soon as I was ready I was given some Crocs to wear and walked across the corridor to another room where I was told to take off my PJ bottoms and lie on a bed with my legs in stirrups. It was a small room, filled with people. The doctor who did the procedure, the embryologist, a nurse and a medical student. As usual they started off by checking and double checking my name and date of birth, then the procedure started. 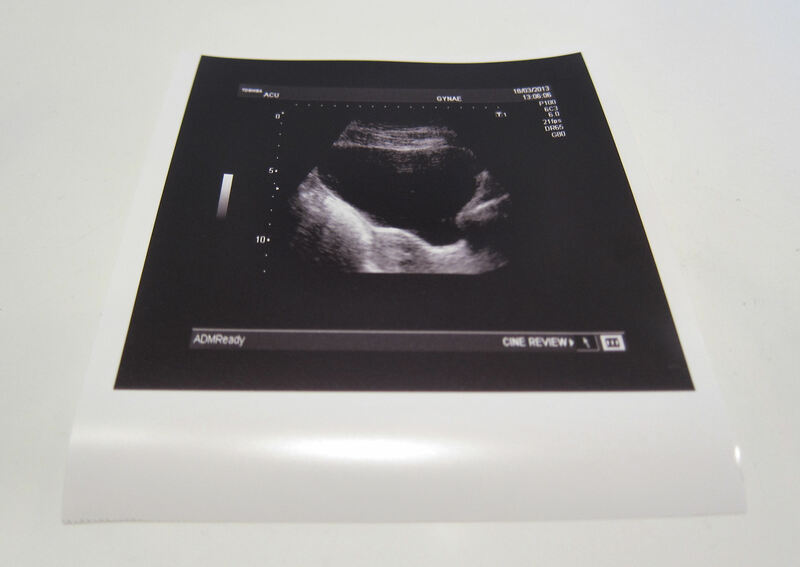 I’d had a dummy embryo transfer back on day one, and this was much the same – like a smear test but at the end they feed a catheter up into the uterus and squirt an embryo in. Except this time I had a full bladder and they did not use lube as it can affect the transfer (sharp intake of breath). The doctor set up the catheter inside me, and the nurse set up an ultrasound to guide him which involved pressing the ultrasound machine against my tummy. It all felt a bit uncomfortable to start with, but I got used to it very quickly. Plus I could watch it on a screen which was pretty cool. This is a printout of the scan which they gave me to take away. Most of it is my very full bladder, it is only the smallest bit down at the bottom that is my uterus. So… erm… yeah. Nice. An embryologist then brought in my embryo, and the doctor transferred it into me, through the catheter. I was then allowed to go to the toilet (aaaaah!) then back to the ward to change into my clothes. A nurse brought me some new progesterone drugs to see if they suit me better, and I was allowed to go. I was away by 1pm, the whole thing took about half an hour, with the actual transfer activities lasting around ten minutes. The great news of the day was the embryo quality. It was graded a4AA blastocyst. This is the highest possible grade given, so it was a very good quality embryo. We will also have some to freeze, but they will not be able to tell us how many until tomorrow. Ah, the relief. So. For the first time ever I am pregnant. Sort of. And now the wait starts to see if it sticks and if I remain pregnant. I am tentatively hopeful. It makes me smile to think the chosen one is in there. Although otherwise I feel entirely emotionally and physically normal which seems wrong after such a momentous event.